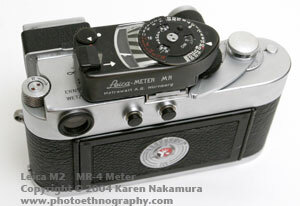 Pictured above is a Leica M2 with attached MR-4 meter. 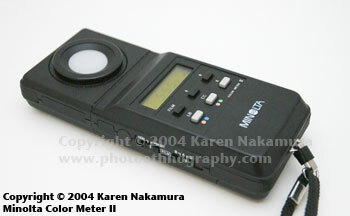 This page covers contemporary light meters and a small section on the bottom on color meters. 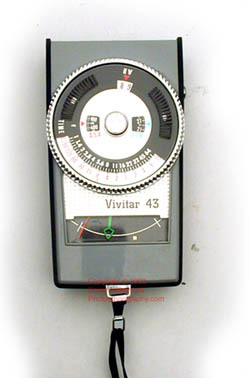 My classic Lightmeter page covers vintage extinction and selenium meters. Reflective meters measure the light reflecting off the subject. This is complicated because a person wearing a white shirt will reflect more light than a person wearing a dark shirt, yet theoretically they should get the same exposure on film. However, despite its flaws reflective metering is the metering type built into all current cameras as it is the only feasible option for metering at a distance. You can have center-weighted or spot metering (or matrix metering for computerized cameras), all of which attempt to determine the proper exposure. Center-weighted metering takes a general metering of the entire scene (as viewed through the camera lens [TTL] or within the view of the meter cell) with more emphasis placed on the central portion of the image. This is the metering style of most older non-CPU based cameras. Spot metering focuses the metering on a very small portion of the scene (typically 1°~5° angle of view). This allows you to measure the amount of contrast on various portions in order to determine the contrast range and appropriate Zone values of each area. For more information on the Zone system see this page. Matrix metering is the newest form used in computerized in-camera through the lens (TTL) metering systems. It divides the scene into 5 ~ 45 areas, meters each one independently, and using a computerized algorithm tries to determine the appropriate exposure value (guessing that areas in the top left and right quadrants of the photo, for example, are the sky or that the central area is the main subject). Incident light metering measures the light falling onto a subject. It's typically done using a small white dome on the top of the meter cell. Unlike the reflective metering, which you point at the subject, with incident metering you must stand in front of the subject and point the white dome towards where the camera will be. The meter measures the amount of light falling onto that location and gives you the number. Incident metering is more accurate than simple reflective meterin and incident is easier to use than reflective because you don't have to worry about subject reflectance (i.e. trying to find an 18% gray in your frame or guessing about whether matrix metering has gotten it right). For further info, Sekonic has a page on Incident vs. Reflective. If I had a million dollars (I'd buy you a diamond ring, as the song goes), then I'd buy myself a nice Sekonic 608 meter. This has all the bells and whistles, including zoom spot metering, viewfinder display of aperture/shutterspeed, and wireless flash metering built in. But back in the real world, I could buy a fully decked out EOS 7e for the price of one of these suckers (~$700). And the Sekonic is pretty huge. Meters are not a commodity item. Only the very odd (classic camera camera collectors; photo students; landscape photographers) and the very rich (studio photographers, well they're not rich but we like to imagine they are) need them. The Sekonic is definitely the high end. Read on further down this page for meters that the average Jane can buy. Differing light metering standards: If you compare light meters from different companies, you'll notice that they will vary slightly. This is because there is no agreement on what a standard neutral gray actually is. In particular, Sekonic meters are said to use an 14% value for neutral gray while others use a 12% or 18% value. See this page "meters don't see 18% gray" by Thom Hogan for more info. In reality, you need to calibrate the meter you own to the film that you use. Photography is more of an art than a science, especially when it comes down to metering. There is no one correct exposure for a scene. Do you prefer more shadow detail or highlight detail? Do you use high contrast or neutral-contrast slide film? If you shoot B&W, how do you develop the film? You need to get used to how your camera or lightmeter meters and build it into your workflow. Have digital camera histograms made standalone meters obsolete? While an incident meter was essential in the days of slide film, to a great degree, you no longer need a standalone lightmeter if you have a digital camera. You can fire a test-shot using the built-in meter, then use the histogram to adjust the exposure so that it fits within the sensor's abilities. A meter would help getting it right in the first place, though. And a flashmeter is still handy if you're trying to balance your strobe lights in a studio environment. Do you need a spotmeter with an older camera? I just received my first rangefinder camera, a manual Zorki 4, and I'd like to know if it's essential to use a spotmeter to ensure the best possible exposure. I intend to take candid shots of people, indoor shots will be frequent. Thanks for any advice on manual rfs and spotmeters. No, a spotmeter is not essential at all. It's a useful tool for situations in which the subject is in drastically different light from where you are, and you can't physically get close enough to avoid that. A perfect example is photographing performers onstage: You're out in the audience where it's dark, they're up on the stage where it's much brighter, and the dark surroundings would confuse an ordinary wide-angle reflected light meter. A spotmeter solves that problem: it lets you take a "close-up" reading from far away. In most situations, though, it's not at all necessary. The most reliable way to get a meter reading under ordinary indoor lighting is to use an incident light meter -- the kind with the white ping-pong ball over the receptor. This type of meter reads the light falling ON the subject, rather than the light bouncing OFF the subject -- the advantage being that it can't be fooled by subjects that are much darker or lighter than average. All you need to do is hold the meter in an area that's getting the same kind of light that the subject is getting (it doesn't have to be right NEXT to the subject as long as the lighting is the same.) Then point the ping-pong ball toward the angle that would be facing the camera, take a reading, and you're good to go. It's almost completely foolproof. An ordinary (non-spot) reflected light meter is handy in some situations also. It's useful for measuring exposure from large, medium-toned areas that you want to render as a middle gray in your picture (grass and trees, for example.) Some meters have a removable or sliding ping-pong ball, so you can take either incident or reflected readings -- this is handy if you want to predict what kinds of tones you'll get. You take an incident reading to get the basic exposure, then take reflected readings of various objects. If the object reads one stop higher than your basic reading, for example, it will come out a bit lighter than middle gray. If it reads a stop lower, it will come out a bit darker. Anything more than about 2-1/2 stops higher will come out as blank white, and anything more than about 2-1/2 stops lower will come out a pretty murky black. By poking around the scene with your meter this way, you can predict where the problem areas will be and get a pretty good notion of how your images will look in terms of light and dark areas. You can do this type of thing with a spot meter, too, but since good ones are quite expensive, I don't think you should buy one unless you really need the ability to measure well-defined areas from a distance. Spot meters have some other disadvantages, too: they're not quite as sensitive in low light, because of the complex optical system in front of the sensor. And they require some thought in interpreting the reading you get: if you point the spot at an area lighter than middle gray, and use the reading as-is, your pictures will be underexposed (the meter isn't smart enough to know it's a brighter-than-average subject; it thinks it's just seeing brighter light than it really is.) Vice-versa if you point it at a darker area; it will think the light level is really low, and suggest camera settings that will give you overexposed pictures. To use a spot meter successfully, you need to be good at estimating how much the different areas of your subject differ from a middle gray tone, and at figuring how much to compensate the readings you get. My advice would be to start with a moderately-priced meter that can take incident and reflected readings, learn to use it well, and THEN decide whether you'd benefit from a spot meter or not. This is my favorite field meter. It's tiny and nestles into the palm of my hand. It has both reflective and incident metering using a small dome that slides in front of the metering cell. Although it feels very plasticy, so far it's stood up to the rigors of living with me (I'm not too gentle on my equipment). It's confusing at first because it doesn't give you the aperture/shutter numbers directly. Instead, it reads Exposure Value (EV) numbers from -4 to 21, which you then have to convert to aperture/shutter-speed using the large dial on top.If you have an older Hasselblad 'C' or other Zeiss leaf shutter lens camera (such as a Contaflex or Kodak Retina IIIc), they are usually calibrated in EV values, so you can dial them in directly. I like this feature as once you start thinking in EVs, this system is quite fast. If your camera has seperate aperture and shutter-speed settings, then it becomes a bit of a pain to go between EVs and that combination. The Digisix has a contrast measurement function, which I admit I haven't used much. When you hold down the metering button, it'll first give you the EV metering, then it'll give you the EV differential between your original metering and the new area. If you're into the Zone and need to know Zone 3 from Zone 7, this is a useful feature, although the field of view of the Digisix (about equivalent to a 95mm lens) is a bit too wide for use as a contrast measuring device. The Digisix also has a built-in thermometer and countdown timer (along with clock and alarm clock). Why is this important? Because if you're using polaroid peel-apart film, you need to know the temperature in order to calculate when to peel them apart. So that along with a timer makes it just perfect. A vital option (!*@#~!!U*!) they should have included it in the box is a screw-in flash shoe for the Digisix. This allows you to mount your Digisix on top of your cameras in the flash mount. Since the reflective metering coverage is approximately the same as a 95mm lens, this works quite nicely as a centerweighted meter. Unfortunately, on my Canon P the shoe is right by the flash mount and so the tail (lanyard loop) of the Digisix pokes me in the forehead. I don't encounter this problem as much with my SLRs (Contaflex, etc.) as the shoe is set deeper into the camera; I think it's unique to rangefinders with the Digisix. Nonetheless, it's a serious problem. Dante Stella has a relatively negative review of the Digisix on his site. I wonder if he has a defective unit since I don't have any of the battery drainage* or aberrant metering issues he had. I admit that I'm being poked in the eye and bugged by the Digisix always being in the wrong mode. *Note: the battery they include in the box is not always the freshest. Mine gave up the ghost after about 8 months. My next battery, has now lasted over a year. Homemade Bracket : Well, if you don't like something, don't complain, fix it. I didn't like the shoe-mount sold for the unit so I machined myself a bracket out of scrap aluminium for the Digisix that mounts the meter well ahead of the shoe on the camera. This prevents the Poked-Eye syndrome. So far except for the meter having a greater propensity to drop when bumped (being higher off the camera), this mount works great. This is the mount pictured on my Canon P. Another (partial) solution would be to file off the lanyard loop on the rear of the meter or wait until it falls off on its own accord. After a while, the lanyard tab fell off my Digisix so that solved that. 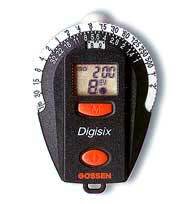 But the Digisix is by far the most convenient, small, mountable, flexible, feature-filled, and inexpensive pocket meter on the market. It's also perhaps one of the most accurate. 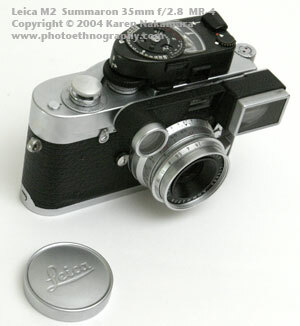 The next best option is most probably the the Voigtlander VC Meter, which I don't own (yet). One-Year Report: Gossen DigisixI've been worried though about ruggedness of the Digisix. I have to say that's it's been holding up very well after a year. I've really abused it, dropping it several times on concrete, keeping it in the same pocket as my keys. The casing has a few dents in it and the white shutter speed dial is a bit worn. The clincher was this past weekend when I washed my kitchen tablecloth and napkins. As I was pulling them out of the washer and into the dryer, my little Gossen Digisix rolled out...!*@#*@!!! @!The screen was blanked out and there was moisture under the LCD. With a heavy heart, I put the unit in front my dehumidifier in the basement and did the rest of the wash.
Well, after a day, I put the batteries in and .... it didn't work.......then I noticed the batteries were in upside down (it's easy to do this with the Digisix) and the unit sprang back to life.You just can't kill this little thing. Ok, I retract that statement. My Digisix is definitely worse for the wear. The lanyard loop has broken off (which is good since it won't stick me in the eye anymore). And I just noticed that the speed dial has a big crack in it. It hasn't gone all the way through, but is definitely serious. That being said, the meter itself is still in full working condition. After two years of hard service (living in my jacket pocket with my keys), my Digisix is getting to be rather sorry looking. The grey shutter speed ring broke in half, so I took the meter apart to fix it. The meter top is secured by two brass '-' screws (they are lacquered to prevent tampering, you have to to scrape off the lacquer; and one '+' screw. Taking the top off the unit, you have to further take the circuit board off to access the shutter speed ring. The circuit board is secured by one brass '-' screw at the tail end. You can then remove the circuit board. You can see the Digisix is pretty much a single-chip design with one very large scale IC controlling the entire unit. The internals of my Digisix were in bad shape. There is no environmental sealing, so when it went through the washing machine a year ago, water entered. Many of the copper VLSI chip leads were corroded. I carefully scrapped off the corrosion and cleaned up the other elements. I epoxied the shutter speed and then put everything back together. And guess what? My Digisix is back in working condition. I have enjoyed your site and other comments on other discussion groups. I wanted to tell you that I have given up on my Digisix. I took it to Belarus as a small travel meter to use with my Rolleiflex. After a week it quit - and replacing the battery only helped for a few seconds. It doesn't drain batteries, instead it quits working (screen goes blank) after a while - depending on how long the battery has been out of the meter. If you leave batteries out for a week or so you can put the same one back in or a fresh battery and it will work for a few hours at first and then quit. Take the battery out for an hour and put it back in and it will work for a few seconds and go blank again. Seems like an internal problem with the electronics. At first I thought it was the battery but since came to the final conclusion that it was a problem with the electronics. I have sent it to Bogen three times with complete discriptions of the problem of the problem each time. Each time it has been sent back with "NC" warranty repair and no other comments. So I have given up on Bogen's warranty department also. And the little Digisix was a present from my wife for Christmas. Too bad, as I have three other Gossen meters that have served me well for years. Finally, the last meter I purchased was a used Gossen Digital Pro F. I love this meter because I can read the readout without glasses! And it takes a single AA battery. I read your Digisix review and the somewhat negative Dante Stella review linked to from your web page. I just received a Digiflash today and noticed something that might be a reason for the inconsistency Dante Stella noticed. The measuring 'gate', or time over which the light is sampled, appears to be very short. I noticed about a 2/3 stop variation when measuring computer screens and under flourescent lights at the US 60Hz standard. Under a flourescent with a bad ballast that flickers visibly, I am getting about 4 stops of variation in the reading. Under steady light, the readings appear to be repeatable to the resolution of the 1/3 stop display. I found that with high frequency flourescent ballasts (probably in the 10-20kHz range, the bulb was unlabeled in that regard), the readings were steady and correct, but varied at 60Hz and lower. I don't have a strobe to find the "breakpoint". The Digiflash also meters flash with shutter speed settings from 1 sec to 1/500 sec, so that is either a variable gate time, or somehow measures samples over several sequential gates. Changing the shutter speed for flash metering mode had no effect on the variability of readings under strobing "continuous" light in ambient mode. I then tried using the "brightness range" mode of the meter under 60Hz flourescent and another flourescent with a failing ballast that flickered more slowly. It turns out that there is an initial reading at whatever instantaneous level the meter happens to catch, and with the metering button held down to measure the range, you get changing readings relative to the initial reading that change about 2-3 times per second. After you release the metering button, the initial reading is shown. Watching these "range" readings carefully, you can take the average +/- range reading and add it to the initial reading for a reading that matches (within the 1/3 stop resolution of the Digiflash) a reading under the same light from my Luna Pro F. So if you catch the initial reading during the brighter part of the cycle, you'll get a negative average range reading and adjust down. If you happen to catch the initial reading during lower output, you'll get a positive adjustment to add to the initial reading. I also found the Digiflash matched my Luna Pro F across its range to well within its 1/3 stop resolution. It would probably be a good idea to ask Gossen about the design, something I haven't done yet. Although you'd probably need to get to an engineer before getting a good answer. I posted to APUG and wrote you because I would have found the meter unusable (or at least really inconvenient) if I had purchased it for use under standard flourescent lights, and I figure anyone considering it should be aware of the issue before making a purchase. For my purposes it's fine, and I like it a lot. I got it for use with an Agfa Isolette I that I just bought, and with my Fuji GW690II, but I like it enough, and it's small enough that I'll probably end up using it a lot with other cameras. 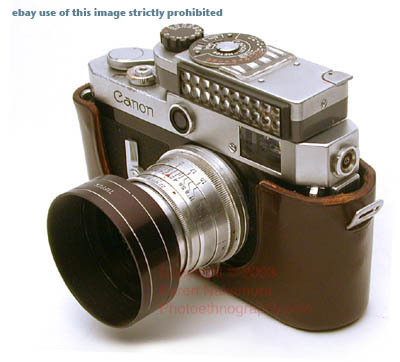 I found that in using it with a Canonet 17 the other day, I made an initial reading and camera setting. Then when the light changed, I just took a quick reading and looked at the change in EV and adjusted the camera in stops rather than bothering to twist the meter dial. Fast, easy, and accurate. One other thing I forgot to mention that occurred to me in trying to figure out the Digiflash readings; it might be intentional. With the advent of high-speed films and digicams that are capable of sufficient exposure under flourescent light levels with higher shutter speeds, the characteristics of the Digiflash will "warn" you that use of longer shutter speeds is necessary for strobing light sources so that a too-short exposure doesn't catch an inappropriate section of the "illumination cycle". Ideally, you'd have an adjustable gate for more convenient metering under these circumstances. Obviously the Digiflash isn't very useful for metering flourescents, even if it does inadvertently warn you about using shutter speeds that are too fast. Not mentioning this in the manual also makes it less of a "feature" and more of a "fault". If true, this would indeed seem to be a serious design flaw. Most of my work is outside so I never noticed this. Indoor/studio photographers might notice it more. What I'm not sure about is whether this is a problem with just the Digiflash or if the Digisix suffers from it as well (since I've never noticed this problem with my older Digisix). If you have any insight or opinion, please feel free to e-mail me. Gossen Digiflash: While in Japan (2003.07), I came across the successor to the Digisix, the Gossen Digiflash. The Digiflash adds flash metering and a blue plastic body but that's it. It costs about thirty dollars more than the Digisix, or $149 at B&H. This seems rather much for a lightmeter, so I haven't purchased it yet. I also saw the Gossen-brand accessory shoe mounts for the Digisix/Digiflash which are designed similarly to my own aluminum version but cost about $14 each. The shoes are made of plastic, which seems to me would break fairly easily. With my recently acquired Digiflash I can confirm Lee Lumpkin's findings to a degree. The readouts are consistent under most circumstances, but vary wildly when trying to meter a (50hz) television screen. A computer monitor in the 75hz, 85hz range seems fine though. All very unscientific of course. In my new 'studio' (a.k.a an emtpy bedroom) the readings with modelling lights, ambient and flash are all fine. I do not have a reference meter to compare it with, but my histograms do show proper exposure. The little Gossen does what it says on the box and I'm happy with it. It will also come in very handy when shooting with my lensbaby, a lens my Nikon D70 cannot meter with. However, the build quality is extremely disappointing. The thing looks and feels like a 5 dollar stopwatch and probably costs the same to produce. Retail price in the Netherlands is 155 Euros though, and it really does not feel like that at all. I'm also worried that the f stop and shutter speed markings will wear away quickly. However, your little meter seems to do fine. I picked up this lightmeter at a used camera fair in Japan. I had left my Minolta in the States and needed a good small incident/reflective/flash meter and this fit the bill. It's a nice design, more compact than the Minolta. It doesn't have all the features I'd like (such as meter averaging and flash/ambient ratio calculations) but it does the trick. Just a note regarding the L-408 vs. L-508 and the newer L-558 and L-608. 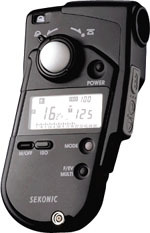 In general, the zoom finder meters have much less sensitive reflective light sensitivity. See the chart below. Since most people only need a 1° spot, you can save yourself money and headaches by getting the non-zoom versions. 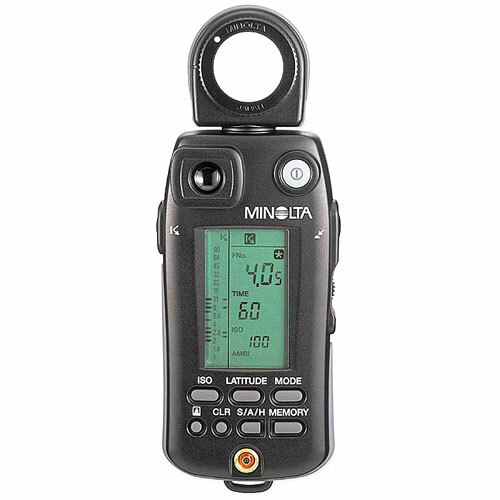 Note that Sekonic and Minolta meters meter slightly differently (the Sekonic will give you a 0.5 underexposure compared to the Minolta). Each manufacturer has their own notion of what a neutral gray is. I think the ISO organization should define this, but there's no consensus. So you have to calibrate each meter or your own developing to match what you want in the final prints. I've also been picking up a bunch of miscellaneous meters at antique shows, other collectors, eBay, and flea markets.Canon P / Canon VI Lightmeter: This is a dedicated lightmeter for the Canon P or Canon VI series rangefinders from the 1950s and 1960s. It snaps onto the accessory shoe and synchronizes with the shutter speed dial. My unit must have been kept in dark storage as the meter cell is still accurate. Many selenium cell meters have died, so make sure it works before you buy it. Those that were stored in dry and dark conditions have the best chance of working. Basements (humidity) and glass cabinets (light) are deadly to selenium. Leicameter MR-4: 71W, 31D, 20H mm Vivitar 43: If found this at a thrift store in Minnesota for $5. This is quite nice. It's powered by a LR44/SR44 watch battery which is still readily available. It has both incident and reflective metering. It reads the light values directly onto an analog meter (most likely a volt-meter). You match green needle on top of the red light value metering and read off your shutter/aperture speed or EV off the dial directly. It's quite fast. You can very quickly change the ISO/DIN without re-metering. It even has cine speeds listed on it, for when you want to dig out your Super 8 film camera.Sekon L-438: I was actually given this for free by a person on one of the mailing lists that I'm on (thanks Jim!). The viewfinder lens was cracked, which mades viewing a bit difficult. Oleg Khalyavin fitted a new lens and it now works perfectly. The L-438 is a spitting image of a 110 format camera, but it's actually a spot-meter reflective meter with adjustable 3° - 10° degree measuring capability. You use it like a small 110 Instamatic: Point, shoot, and it gives the EV metering in the viewfinder. On top it tells you the effective EV and Shutter-Speed/Aperture combination. In reality, there are some bugs. The viewfinder EV reads only for ISO 100, you have to remember to look on top for your effective film speed EV if you want to dial the EV directly into your Hasselblad. The 3° spot is a bit larger than it should be (1° is ideal). These are mechanical and so aren't the most reliable meters, they were quickly superseded by digital spot-meters. But for free + $20 repair, the price couldn't be beat and I carry it around with my Digisix for my Hasselblad. The light meter story continues with a look at vintage selenium and extinction light meters on the Classic Lightmeter page. Calculate exposure values using your eyes as a light meter and your brain as a calculator! Last modified: Tuesday, 20-Dec-2011 00:49:15 EST , [an error occurred while processing this directive] . Thank you for providing such a useful resource on things photographic. I had not been able to find out whether the Honeywell Pentax spot meter, which used PP3 9V and mercury 1.3V batteries, would work properly with a 1.5V P640A alkaline cell. The answer seems to be it does. I tested it against two other camera metering systems (OM1-N and OMSP-2) and the results were consistent to better then 1/3 of a stop. Also, since the 9V battery powers the lower more sensitive scale range, while the 1.3V runs the normal upper scale, I could test the readings given by each battery to check for consistency. The lower end of the low sensitivity scale maps to the high end of the more sensitive scale; finding something that was exactly the right brightness to register 10 on the more sensitive (9V) scale and then switching to the less sensitive scale (using the 1.5V P640A) the readings were identical.